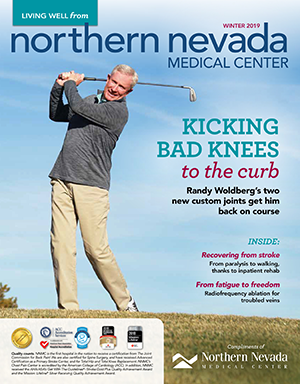 Living Well from Northern Nevada Medical Center is a publication designed to bring you the latest news as well as health and wellness information you can use throughout the year. You can read the latest issue here, or sign up to have Living Well mailed directly to your home. With the vision of expanding patient services and being the healthcare provider of choice in the area, construction on the first of three phases of expansions at NNMC is well underway. In April 2017, Bill Galine needed inpatient rehabilitation following a stroke. He arrived at NNMC to begin what he and his wife, Vicki Bovee, refer to as the jump-start in his journey back to health. Randy Woldberg had such a great experience with his first knee replacement, he knew exactly where to have the second. Joint replacement surgery is not something to be taken lightly. But for patients needing it, having choices can help make the process a little easier. The Leapfrog Group, an independent healthcare rating organization, rated Northern Nevada Medical Center “A” for patient safety in both the 2018 rating periods, spring and fall. John Nepper had a history of varicose veins, but when his right leg started to become fatigued after walking just 50 feet, he knew he had to seek medical treatment. If you need to have a surgical procedure done, you may be eligible to have it at an outpatient surgery center. While there are advantages to both hospitals and these facilities, choosing which one can depend upon several factors.